To create a partner account ontact DesignQuote via the email provided on your designer dashboard. So you get leads that you can't use? Don't throw them away! Forward them to DesignQuote and earn a commission on every one. Since 2006 DesignQuote has connected Designers with Clients. Start earning from those unwanted leads. No Registration Required: The system creates your account when you send your first lead. Sending a lead is as simple as forwarding an email. Instead of Delete - Forward and Earn! Real-time account status. Login to see the status of your leads and payments. Instead of rejecting those clients, help them find a suitable vendor. DesignQuote has been around since 2006, we are a trusted established lead broker used worldwide. Sending in a lead to DesignQuote for participation in our partner program binds you to the terms and conditions below. When you forward a lead please make sure it has at least a Name, Phone and/or email, and description of the work. Without this information we can not verify or post the lead. Leads must be verified as good to be paid. If we can not reach the client and verify that they want this project posted, the lead is invalid, we will not post it and you will not get paid for it. Additionally, if we find the lead to be bogus (eg. Designers report it bogus, we refund the designers) you will not be paid for the lead, as we will have to refund our designers. If you send the same lead twice it will simply be deleted. Payments are made via PayPal or company check from Web Directories Inc. Payments are processed on the 5th of each month. In order to receive a payout you must have a balance of at least $50. 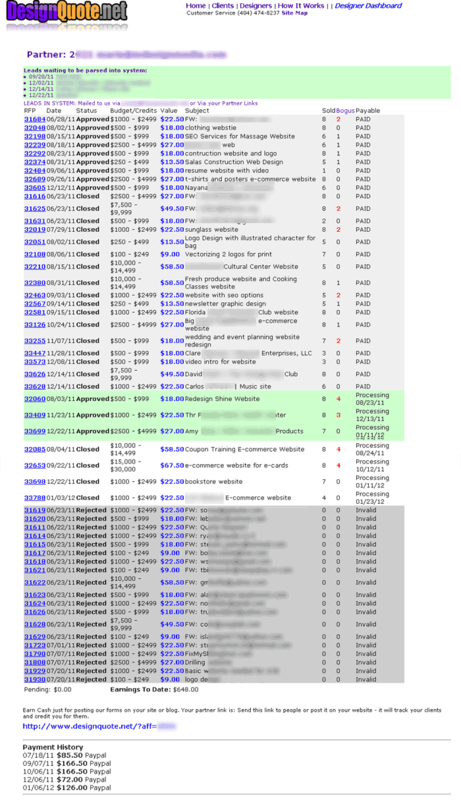 Leads become payable 20 days after the project closes (usually 7 days after its posted). As long as the lead is valid it will be payable. If a lead is under investigation for being bogus it will not be payable until the investigation is complete. When designers report leads as bogus we investigate the claim, if the lead is found to be bogus we refund the designers and the lead is no longer payable. For more information on what qualifies as a valid lead, please read our Designer FAQ. 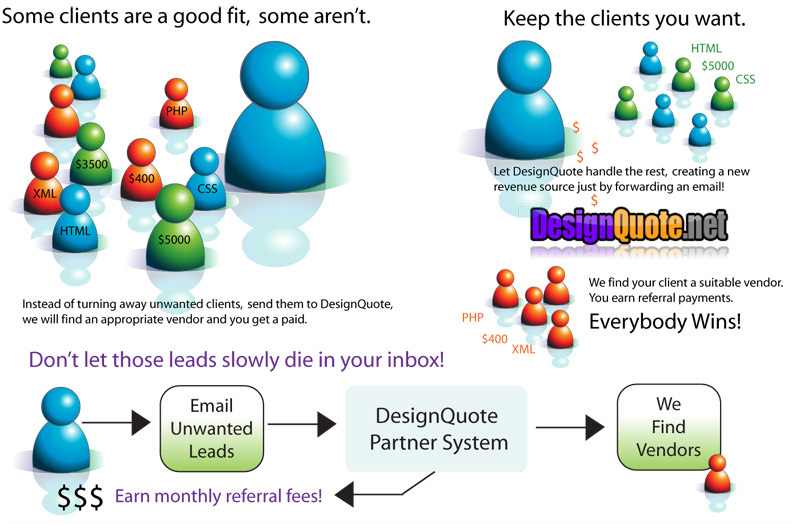 When you mail a lead to DesignQuote an account is created based on that email. All future leads mailed in are grouped under that email address. You also receive a Partner ID which allows you to use forms and links to send in new leads directly from your website. If you change your email address or use two different emails to send in leads you will create multiple accounts. WE DO NOT GROUP ACCOUNTS. Please make sure you only use one email account. If you do create multiple accounts, the payment rules apply to each account. So if you send in 3 leads in one month all from different emails, you may have a total combined balance that is high enough to receive a check that month, however since WE DO NOT GROUP ACCOUNTS, you will only receive payment on accounts that meet the minimum payout level. Sending in multiple copies of the same lead. Sending in too many bogus leads. Misrepresenting or Negatively affecting DesignQuote. We expect all of our partners to maintian a professional and positive image and exercise fair and ethical business practices. We do not accept leads for adult or gambling websites. DesignQuote reserves the right to ban and or close any partner account at any time. Any actions by a partner that DesignQuote finds to be illegal, unethical, misleading or in any way harmful to the DesignQuote brand may result in termination of your account without warning. If your account is closed you will forfiet any and all payable earnings. Refers 15 leads with an average of a $2000 budget. Each lead is worth $22. 15 x $22 = $330 monthly earnings. We partner with several popular web design companies that are turning away many small jobs. Refers 50 leads with an average of a $700 budget. Each lead is worth $18. 50 x $18 = $900 monthly earnings. DesignQuote is the largest design lead company in the world. We pay out several thousand dollars in commissions every month. Please note: We strive to keep the highest quality leads for our designers, and to provide the best designers for our clients. By participating in this affiliate program you agree to abide by our quality standards. As per the terms of service, if we find any kind of inappropriate methods used to market our services, or find anyone posting fake leads, your account will be banned immediately and you will forfeit any earnings or commissions. This is an example of the partner dashboard. You can see every lead we post.